The Estwing Geo Paleo Pick features a rugged blade end that is perfect for digging, while the pointed end is great for breaking up hard dirt and prying rocks. Built to last with a durable, powder-coated finish, the pick is designed with a textured vinyl grip handle that measures 25 in. long with a head spanning 14 in. from pointed edge to chisel edge. Users and bystanders should always wear safety goggles during use to help prevent injury. 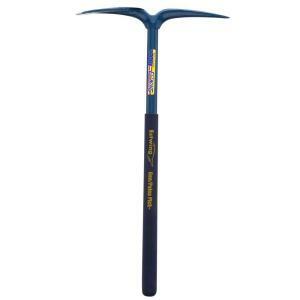 Tbook.com crawls the web to find the best prices and availability on Estwing and related Tools and Hardware products like Estwing 25 inch Geo Paleo Pick Blades. For this page, related items include products we find that match the following keywords: "Estwing" at our vendor partner Home Depot. Estwing 25 inch Geo Paleo Pick Blades is one of 156 Estwing and related products listed in the Tools and Hardware section of Tbook.com If you have any questions on this product, please give us a call at 734-971-1210 during the hours of 9am - 5pm EST for assistance. Thank you for shopping at Tbook.com, the Internet Department Store!